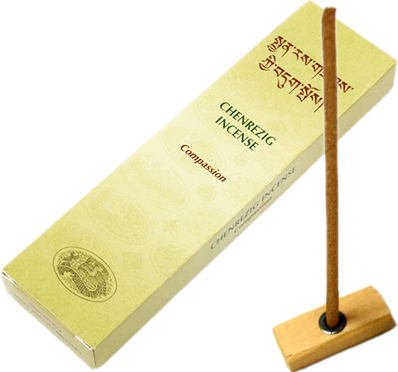 This Chenrezig Tibetan incense is specially made for use as an offering to the Buddha of Compassion. It helps us to increase our power to attain love and compassion and delicate fragrance creates a peaceful atmosphere and stimulates a feeling of wellbeing. Chenrezig Incense uses no bamboo core, contains natural ingredients, is non-toxic and hand rolled in accordance with traditional Tibetan methods.